This elestial quartz crystal weighs 36.3 pounds! This wonderful decorator specimen of elestial quartz crystal weighs 36.3 pounds! Its color is a natural medium smoky brown color as shown. This beautiful decorator specimen was polished from a natural elestial quartz crystal mined in Minas Gerais, Brazil. It is semi-transparent to transparent with many internal rainbow reflections. The fine quality checkerboard citrine gemstone in the center of this wonderful pendant is an 18x13mm gem with rich lemon yellow color. This large citrine jewelry design was handcrafted in sterling silver with open back settings. It is also set with a 16x12mm faceted pear shape gemstone of genuine smoky quartz crystal, and with a 4.5mm square faceted gemstone of genuine peridot at the top! 45.8 pound Elestial Quartz Crystal Sphere! This 9.8 inch diameter sphere of natural elestial quartz crystal has a fine quality finish and it weighs 45.8 pounds! You can see into this genuine elestial quartz crystal ball's interior from a minimum of about 1/2 inch deep up to about 4 inches deep maximum visibility, with an average visibility of about 2 inches deep. This elestial quartz sphere has a natural light smoky color, and it has planes and veils inside with many internal rainbow reflections. This wonderful elestial quartz crystal ball looks fantastic on a light box! We are offering this large decorator sphere of natural elestial quartz crystal (rock crystal) at a special offer below wholesale discounted price of $180/kg = $3744. Flawless 239.3 carat Natural Smoky Quartz Gem! Large Smoky Quartz Necklace in Sterling Silver! Set with 158 carats of faceted smoky quartz gemstones! This fine quality smoky quartz necklace was handcrafted with open back settings in 925 sterling silver and set with 7 very large natural color smoky quartz faceted gemstones! The cushion cut gems measure 23x16mm, and the center stone is a 26x19mm pear shape gem. This attractive necklace has 158 carats total weight of natural smoky quartz faceted gems! Each of these superior quality gems is eye clean, and they are unheated and untreated with completely natural color. The center stone measures just measures one inch long, and this beautiful centerstone alone weighs 28 carats! The gemstones in this natural smoky quartz jewelry design were faceted from eye clean areas within 100% natural smoky quartz crystals that were mined in Brazil. See also a full view photo of this natural smoky quartz necklace. GIANT 480 carat Smoky Quartz Bracelet!! Set with 480 carats of faceted smoky quartz gemstones! This unique smoky quartz bracelet was handcrafted in 925 sterling silver and set with 6 huge natural color smoky quartz gemstones! This gigantic bracelet has 480 carats total weight of natural smoky quartz gems! These beautiful gems are eye clean, and they were faceted with checkerboard tops. They are natural smoky quartz gems, and they are unheated and untreated. The largest gem at the center measures 2 inches long, and this amazing centerstone alone weighs 190 carats! The gemstones in this natural smoky quartz jewelry design were faceted from eye clean areas within 100% natural smoky quartz crystals that were mined in Brazil. This amazing smoky quartz bracelet has open back settings underneath each of the faceted smoky quartz gems. See also a close-up view of this natural gigantic smoky quartz jewelry design. Set with 51 carats of natural smoky quartz faceted gemstones! This lovely smoky quartz bracelet was handcrafted in 925 sterling silver and set with six natural color smoky quartz gemstones. These beautiful gems face up eye clean, and they are well cut. They are unheated and untreated, and each one is a faceted pear shape measuring 16x12mm. The gemstones in this natural smoky quartz jewelry design were faceted from eye clean areas within 100% natural smoky quartz crystals that were mined in Brazil. This handcrafted smoky quartz bracelet has open back settings underneath each of the prong set smoky quartz gems with heart shape designs in the sterling silver. See also a full view photo of this natural smokey quartz bracelet. 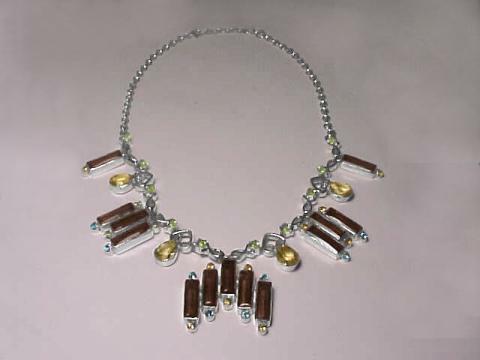 Natural smoky quartz pieces of superior quality with natural light to medium smoky brown color were ground and polished into tire-shaped beads and then drilled & strung in this 18 inch smoky quartz necklace with a sterling silver clasp. These beautiful smoky quartz beads are lightly included to completely eye clean! This natural smoky quartz jewelry design is unheated and untreated. The photo at left shows a close-up view. See also a full view of this genuine smoky quartz necklace. Item smqj173a: Natural smoky quartz necklace with 170 carats of tire shaped smoky quartz beads measuring 6.5mm in diameter. 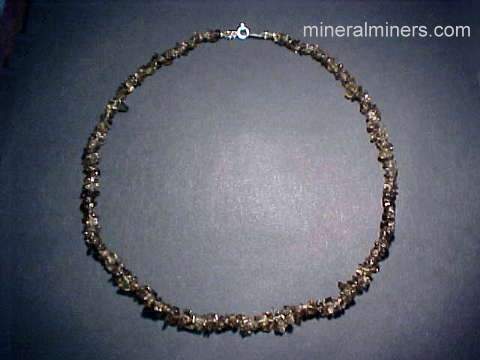 Item smqj173aa: This extra large size natural smoky quartz necklace has 330 carats of tire shaped smoky quartz beads that are gradational in size measuring 8mm in diameter at the clasp and increasing to 10mm in diameter in the center of the necklace! This natural smoky quartz ring was handcrafted in sterling silver and set with a natural color smoky quartz cabochon gem. The smoky quartz gem in this ring was hand-ground and polished into a 16mm triangular shaped cabochon from a natural smoky quartz crystal with excellent transparency that was mined in Brazil. This large size natural smoky quartz ring was handcrafted in sterling silver and set with a natural color smoky quartz cabochon gem. The superior quality smoky quartz gem in this ring is a 16x12mm oval shaped cabochon gem that was handcrafted from a natural smoky quartz crystal mined in Brazil. This natural smoky quartz ring was handcrafted in sterling silver and set with a fine quality natural color smoky quartz faceted gem with concave cutting giving the gem amazing brilliance! This beautiful smoky quartz gem weighs 12 carats. It was faceted into this 17x13mm rectangular cushion-cut shape from a natural smoky quartz crystal with eye clean transparency that was mined in Brazil. This beautiful smoky quartz ring was handcrafted in sterling silver and center set with a 12x9mm natural smoky quartz checkerboard cushion cut gemstone, and with an 8mm checkerboard trillion cut natural smoky quartz gem on each side! This fine quality smoky quartz ring is a unisex style, it looks very good on a man's or women's hand. This heavy 925 sterling silver ring was handcrafted and set with a natural color smoky quartz checkerboard-top faceted gem. This fine quality smoky quartz ring is a unisex style, it looks very good on a man's or women's hand. The superior quality smoky quartz gem in this ring is eye clean, and it measures 16x12mm. This fine gem was cut and polished from a natural smoky quartz crystal that was mined in Brazil. The photo at left shows a top view photo. See also a side view of this natural smoky quartz ring design. This natural smoky quartz gemstone weighs 74 carats! This giant size smoky quartz ring was handcrafted in 925 sterling silver and set with a huge checkerboard-top faceted gem natural color smoky quartz. The superior quality smoky quartz gem in this ring is eye clean with an oval shape, and it measures 37x25mm! This fine gem was cut and polished from a natural smoky quartz crystal that was mined in Brazil. This large smoky quartz pendant was handcrafted in 925 sterling silver and then set with a 31mm x 25mm oval shaped cabochon gem of natural color medium-dark brown smoky quartz weighing 54 carats. This genuine smoky quartz gemstone faces up eye clean. It has faint natural inclusions that are only visible under close inspection with bright illumination. This handcrafted smoky quartz jewelry design has an open back setting underneath the natural color smoky quartz gemstone. See another photo of this natural smoky quartz jewelry design. This natural smoky quartz pendant was handcrafted in sterling silver. This genuine smoky quartz jewelry design is set with an 11mm square checkerboard cushion-cut faceted gem of natural smoky quartz with natural color. The photo in the right half at left is a back-view showing the lovely heart designs in the sterling silver. This natural smoky quartz pendant was handcrafted in sterling silver with open back settings and a large bale. This genuine smoky quartz jewelry design is set with a 12x10mm rectangular shaped checkerboard faceted gem of natural smoky quartz below a 6mm round faceted natural smoky quartz gem. This beautiful smoky quartz pendant was handcrafted in a solid 925 sterling silver design and set with five 5mm round faceted gems of natural smoky quartz! These genuine smoky quartz gems are all unheated and untreated with rich smoky-brown natural color. This large natural smoky quartz pendant measures over 2 inches long. 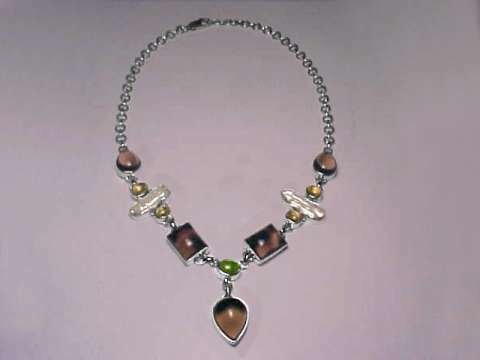 It was handcrafted in 925 sterling silver and set with faceted gemstones of natural color brown smoky quartz. There is a 6mm round gem up above, a 12x6mm marquis shape gem in the middle, and a 3mm round gemstone below. All three are natural color brown smoky quartz gemstones. This natural smoky quartz pendant was handcrafted in sterling silver with open back settings. This genuine smoky quartz jewelry design is set with a faceted 8mm round gemstone of natural light brown smoky quartz, and with a 12x6mm marquis-shape faceted gemstone of natural deep red garnet. This unique meteorite pendant was hand-crafted in 925 sterling silver and set with a genuine sikhote alin iron-nickel meteorite measuring 13x10mm. This unique pendant is also set with a Guangdong tektite measuring 20x14mm, a faceted pear shape smoky quartz gem measuring 11x8mm, and with a 5mm round faceted quartz crystal gem. This lovely smoky quartz necklace has large free-form shaped smoky quartz beads that are gradational in size with the largest beads in the center of the necklace measuring up to 19mm long (0.75 inches long!). The superior quality beads in this smoky quartz necklace are lightly included to eye-clean with beautiful light to medium smoky brown color. They were drilled and polished from smoky quartz crystals that were mined in Brazil. Smoky quartz is sometimes called cairngorm crystal or cairngorm stone. This natural smoky quartz pendant was handcrafted in 925 sterling silver with an open back setting. This smoky quartz jewelry design is set with an eye clean concave faceted 27x21mm oval shape gem of natural smoky quartz weighing 44 carats with rich smoky-brown natural color. This beautiful smoky quartz bracelet was handcrafted in sterling silver and set with 7 multi-shaped natural smoky quartz gemstones measuring from 9mm in diameter up to 10x8mm. The gems in this natural smoky quartz jewelry design were faceted from clean areas within 100% natural smoky quartz crystals that were mined in Brazil. This beautiful smoky quartz bracelet has open back settings underneath the faceted smoky quartz gemstones. See also a full view photo of this genuine smoky quartz bracelet. Set with 86 carats total weight faceted smoky quartz gems! This natural smoky quartz bracelet was handcrafted in 925 sterling silver and set with seven 16x12mm natural smoky quartz gemstones weighing 86 carats total weight! These natural smoky quartz gems were faceted in calibrated rectangular cuts from clean areas within 100% natural smoky quartz crystals that were mined in Brazil. 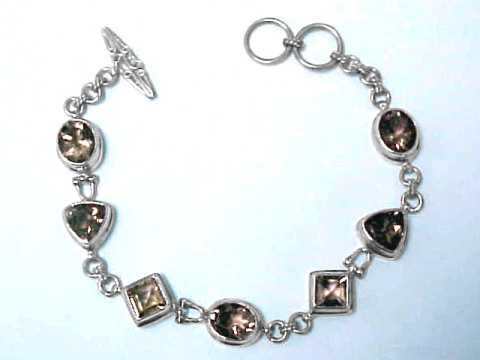 This bracelet has open back settings underneath the natural smoky quartz gemstones. The photo at left shows a close-up. See also a full view of this natural smoky quartz bracelet. Set with 126 carats total weight faceted smoky quartz gems! This beautiful smoky quartz bracelet was handcrafted in 925 sterling silver and set with 7 large multi-shaped natural smoky quartz gemstones measuring from 16x14mm up to 22x16mm, with 126 carats total weight of natural smoky quartz gems! The gemstones in this natural smoky quartz jewelry design were faceted from clean areas within 100% natural smoky quartz crystals that were mined in Brazil. This beautiful smoky quartz bracelet has open back settings underneath the faceted smoky quartz gems. See also a full view photo of this natural smoky quartz jewelry design. This natural smoky quartz pendant was handcrafted in sterling silver and set with two 12x6mm and two 12x10mm faceted marquis shape gemstones of natural smoky quartz. These are natural smoky quartz gemstones that have not been heated or treated in any way. This handcrafted smoky quartz jewelry design has open back settings and a very beautiful dragon-fly shape. This genuine smoky quartz pendant was handcrafted in sterling silver and set with three natural smoky quartz faceted gems; a 12x9mm checkerboard pear-shape, a 12x10mm checkerboard oval, and an 8mm checkerboard round smoky quartz gem at the top. These are natural smoky quartz gemstones that have not been heated or treated in any way. This beautiful smoky quartz jewelry design has open back settings. This heavy sterling silver pendant was handcrafted with an open back in a beautiful braided design and bezel set with a checkerboard oval 18x13mm faceted gemstone of natural smoky quartz. This is a natural smoky quartz gemstone that has not been heated or treated in any way. This large smoky quartz pendant was handcrafted in 925 sterling silver and set with two beautiful cabochon gemstones of natural smoky quartz! The oval shape cabochon measures 20x17mm, and the pear shaped cabochon measures 13x11mm. This lovely handcrafted jewelry pendant has open back settings underneath the natural smoky quartz gemstones. Smoky Quartz, Peridot, Citrine and Topaz Necklace! This amazing mutli-gem necklace was handcrafted in sterling silver and set with the following gemstones: thirteen rectangular faceted smoky quartz gems measuring 18x7mm each, eleven 3mm round faceted golden citrine gems, four 12x9mm faceted pear shape golden citrine gems, eight 3mm round faceted sky blue topaz gemstones and ten 4mm round faceted peridot gems. This beautiful necklace has open back settings underneath each gemstone. See also a full view photo. Smoky Quartz Necklace with Peridot, Pearl & Citrine Necklace! 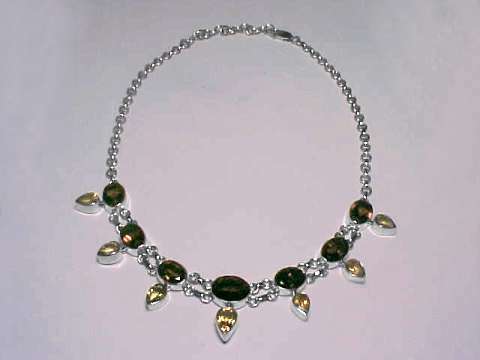 This beautiful necklace was handcrafted in 925 sterling silver and set with lightly included natural cabochon gems of smoky quartz, citrine, and peridot. There are also two freshwater pearls measuring 23x8mm! The large pear shape smoky quartz gemstone at the center of this lovely necklace measures 20x15mm. 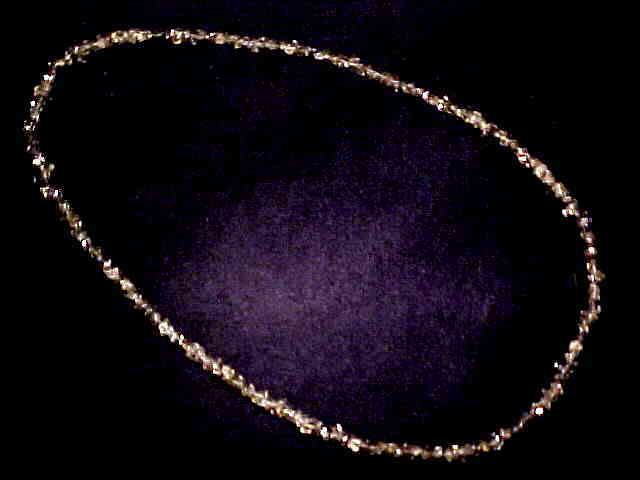 This necklace has open back settings underneath each gemstone. See also a full view photo. Superior quality natural smoky quartz crystal pieces that were mined in Brazil were tumbled & polished in baroque shapes, and then drilled and strung in this 18" long natural smoky quartz necklace with a sterling silver clasp. These smoky quartz crystal beads have beautiful gem-grade transparency. There are approximately 250 drilled baroque beads in each of these beautiful smoky quartz necklaces! The photo at left shows a close-up view, see also the full-view photo. This is the end of our Smoky Quartz Spectacular Items virtual gallery page. See also our natural quartz crystals, and our natural quartz crystal balls. To see more smoky quartz photos, just select another item category from the table below. To see photos of another mineral variety, select any item category link in our Mineral Inventory & Factsheet Index. Would you like us to inform you when we add on this page more rare collector quality natural smoky quartz crystal items? We have a large inventory of natural smoky quartz items at our mineral warehouses, so be sure to let us know if you have any special requests. Please contact our webmaster or our 'site' geologist with any questions or comments.